What programs can I use to broadcast gameplay using my Razer Seirēn Elite? We recommend using Open Broadcaster Software(OBS) or XSplit. When I speak loudly, my voice gets distorted. How do I fix this? To prevent distortion occurring when you speak loudly, activate the AGC(Automatic Gain Control) in the custom panel of your recording devices tab. To do this, search for properties under the sound devices section, then click on the custom tab. I can't mount my Razer Seirēn Elite on my microphone arm as the screw is too small. Ensure you are using a 5/8" thread screw to mount your Razer Seirēn Elite; if your mic arm does not fit, you may need to obtain a 3/8" to 5/8" adapter. There seems to be a lot of popping when I speak into the microphone. How can I fix this? Do not place the microphone directly in front of your mouth, position the microphone off to the side so that the air from your mouth does not directly hit the microphone when you speak. Alternatively, you can equip the windscreen that came packaged with the Razer Seirēn Elite. I am picking up a lot of background noise when I use the microphone. What can I do to reduce this sound? Ensure that your microphone is positioned close to your mouth; lower the gain of your microphone. Ensure that there are no fans or air-conditioning units blowing directly onto your Razer Seirēn Elite. Broadcasting software like OBS come equipped with plugins that can assist in the reduction of background noise. Find out more here. Sound from my computer is bleeding into my microphone audio feed in OBS/XSplit. What is causing this? One potential reason for this could be the interferences caused by your headset's built-in microphone. To correct this, use the splitter that came with your headset before plugging the headphone portion of the splitter into your Razer Seirēn Elite. If you are still experiencing the issue, try plugging your headphones into the audio port on your computer rather than your Razer Seirēn Elite. I am not peaking in OBS/XSplit, but the LED on the mic is activating. 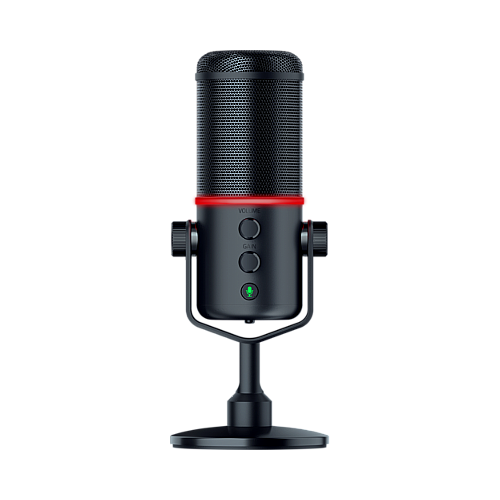 There are two(2) microphone checks performed when using both OBS/XSplit and your microphone; one on your software side and one from the microphone itself. To ensure optimal recording, ensure that peaking does not occur on either platform. What are the warranty terms for the Razer Seirēn Elite? You may find out more information on the policies for Razer Seirēn Elite here. How can I modify or disassemble my Razer Seirēn Elite? We cannot help you in modifying or disassembling your Razer Seirēn Elite since that will void the manufacturer's warranty on the unit. How do I request or purchase replacement parts for my Razer Seirēn Elite? One of the features of my Razer Seirēn Elite does not work. If you're unable to find an answer that helps resolve the issue, please contact our Customer Support team here. User guides and product manuals are also available on the support page. I think my Razer Seirēn Elite is defective and would like an RMA/exchange. I have a coupon/promotional/gift voucher code for RazerStore. Where can I enter the code so I can use it to purchase products? From your shopping cart page on Razer Store, please check the box labeled "Enter Promo Code”. Enter the code into the box and click "Apply Code." The total price after should reflect the discount. I recently placed an order on Razer Store and it still shows my order is "In Process". When will my order ship? We are sorry if there are any delays in processing your order. The product may be out of stock or the order may be under protection/fraud review. To check your order status, enter your information into the relevant fields on the Order Status page. What are some examples of a proof of purchase to provide when initiating an RMA?